A mosaic is a decorative art form that is created from small pieces of stone or glass placed together to form a pattern, design or original piece of art. They have been used by cultures dating back thousands of years and are still commonly used today. We at Stone Masters are huge fans of the art form and offer many different forms of stone, glass and artistic mosaic tiles. Our showroom in the Greater Toronto Area keeps samples of all of the stone mosaic tile we offer and if you are traveling locally please stop by for a look around. We at Stone Masters also offer installation locally in Toronto if you do not already have a contractor to install your stone mosaic tile. If you are outside the GTA, we highly suggest choosing a contractor with experience fitting tile as it would be a shame to damage it during installation. We can create custom pieces in any colour we offer that are guaranteed to fit correctly and give your backsplash, countertops or flooring the unique and beautiful treatment it deserves. Our tile is sourced from all over Europe and the colours vary from neutral Earth tones to polarizing greens and rich blues; it really just depends on what works best for your project. You might be wondering whether it is a good time to upgrade your kitchen or bathroom.There are lots of scenarios, but the ones below are pretty common. Home sale - A tired kitchen revamped with an awesome mosaic stone tile backsplash can be the difference between a quick sale and a prolonged stay on the market when you could really stand to close the deal. We at Stone Masters have creative mosaics that can put your house over the top. Renovation - When you decide to add a few new appliances or cabinetry, maybe a new tube to your bathroom, it is a great time to choose stone mosaic tile. The clean lines and beautiful colours can really complement the new additions. Value increase - When it comes to making changes to your home to increase the value, studies have shown the two best rooms to make improvements are the bathrooms and kitchen because you will get the best return on your investment dollar for dollar. Stone Masters offers quality mosaic stone for reasonable prices that the average homeowner can afford. The bottom line is that we here at Stone Masters are committed to providing our customers in Toronto and all over the world with the highest quality of premium mosaic stone tile and when you strike a deal with us, we will not rest until you are satisfied! 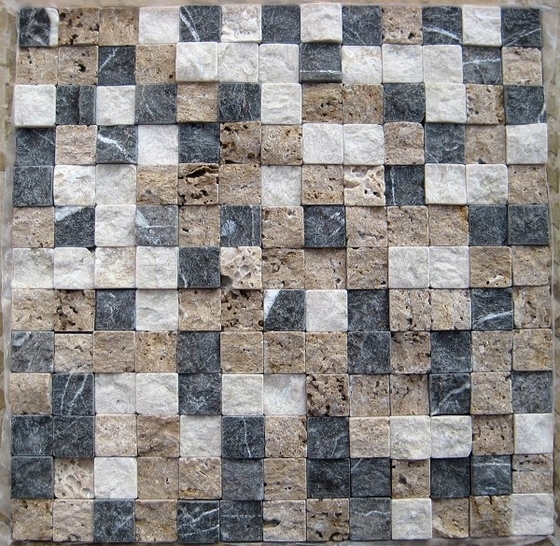 We offer stone mosaic tile in Toronto for walls, backsplashes, decorative art, etc. If you’re making improvements to your home or place of business, you can’t go wrong with stone mosaics. They are beautiful and look great in any setting. After you’ve designed or remodeled a room in your home, it’s time to add the finishing touch. 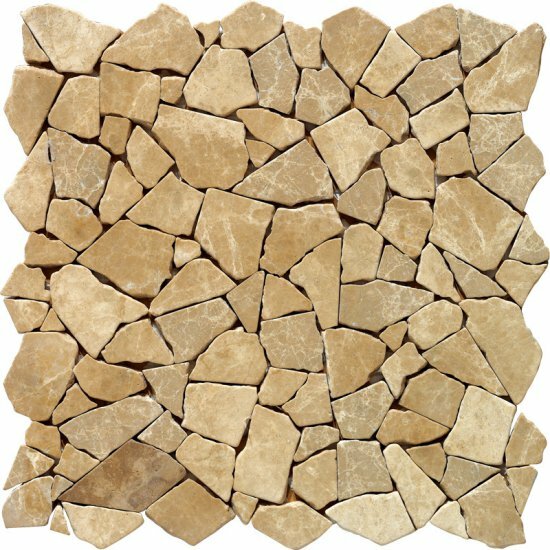 Mosaic tiles made of natural stone such as travertine are available in many patterns and textures. You have 33 options to choose from in our catalogue. We can also do custom designs. Mosaic pieces can be cut into any shape, from square to asymmetrical. A variety of finishes are available, including woven, split-face, honed, and more. Patterns range from floral to geometric. If you’re interested in a modern design, geometric patterns are a great choice. These have gained some popularity as kitchen backsplashes. Travertine tile is an earthy and rich product that brings timeless brilliance to the home. Depending on the pattern and finish, it can be used to create either a clean subway look or a rustic design. Yellow travertine is a good choice if you wish to add warm colour to your project. If you would prefer something darker, you can’t go wrong with Nero/black marble. It will help you achieve a dark stacked brick look. Noche travertine that has gone through a tumbling process is an unparalleled choice for a warm antique look. Mosaic tiles can also be placed on the floor. You can create a cobbled-stone floor with any of our Irregular stone tiles. Travertine is an environmentally-friendly tile, as it is made from a natural material. Since it’s easy to cut and shape, it can be used to fill in small or oddly shaped spaces. Travertine is a versatile material that looks great in a wide range of designs and colour schemes. Since it’s easy to work with, you can easily change it out if you get bored with the look. However, it’s still durable enough to last for as long as you want it to. Stone Masters offers the highest quality Travertine available in today’s market. Marble mosaic tiles offer a lot of benefits as well. Whether you want it tumbled or polished, marble adds a bit of sparkle anywhere it’s installed. With its hypoallergenic properties, marble is resistant to the collection of allergens and bacteria. This makes it ideal in areas where pets may roam. For many people, the bathroom and kitchen immediately come to mind when it comes to marble mosaics. However, they can be used in many rooms, including the dining room, living room, and bedrooms. Look through our catalogue for some images of marble mosaics for ideas. We not only offer quality stone mosaic tile, we also offer installation services locally in Toronto. Tell us about your ideas and let us help you choose the right tile pattern and size. 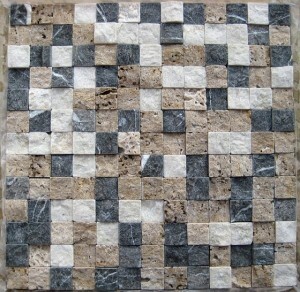 You might also be interested in our countertops and backsplash products to go with travertine or marble mosaics. Call us today to learn more or to get a free quote.